Ideal to use in the classroom when preparing a special gift for Mother’s Day. Select the bookmark design(s) most suitable for the children in your class. Three designs have been provided to accommodate different needs and preferences. Print and cut the black and white bookmarks. Allow the children to choose a design that they think their mother/guardian would love. 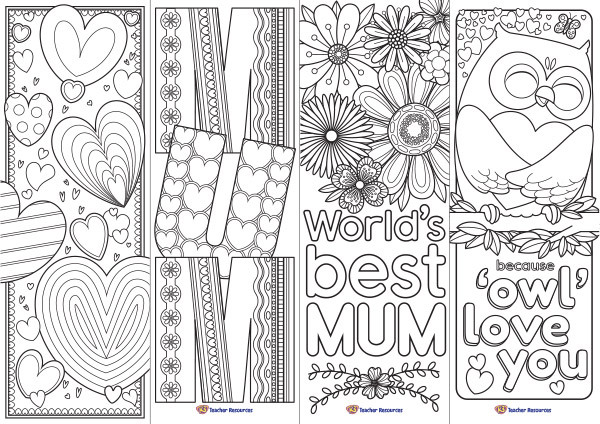 Ask the children to carefully colour in their selected bookmark. Tie a ribbon around the bookmark (optional). Ask the children to give their special bookmark to their mother or guardian on Mother’s Day. This is listed as being a free resource then asks you to upgrade to Premium. Hi Lesley. Thank you for bringing this error to our attention. I have updated the permissions, so the download is now available for free. It says this is a free teacher resource. When I try to download it it says I have to pay$29. Not free then is it! Hi Peter. Thank you for bringing this error to our attention. I have updated the permissions, so the download is now available for free.